Samantha continues to grow and is doing very well. She had a checkup with the doctor last week and is now up to 7 pounds, 3 ounces. The funny thing is that good friends of ours, Christine and Joe who recently invited us to their place to celebrate their son Quinn’s birthday, just had another baby Wade. 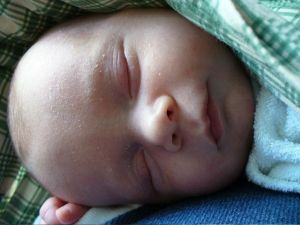 Wade arrived at 7 pounds 4 ounces, so Samantha is probably the exact same weight as Wade although she is a month older. She is still just eating and sleeping of course and we are managing the late night feedings well. We do look forward to the day when she sleeps through the night but that will be a while yet. She is also getting pretty strong and is holding her head up without any problem. We still need to be very careful because she will often just decide to go limp and we have to be ready to catch her head. She’s just trying to keep us on our toes. This entry was posted in Samantha on October 3, 2007 by jrand.